This metallic thread provides light coverage on 18-count canvas, and perfect coverage on 24-count Congress Cloth. 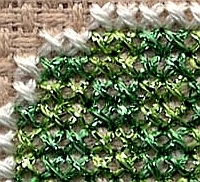 Can be used in overstitching or as a blending thread on larger needlepoint canvas counts. Click on arrow to close tip. Laceweight; equivalent to about a #10 crochet weight. 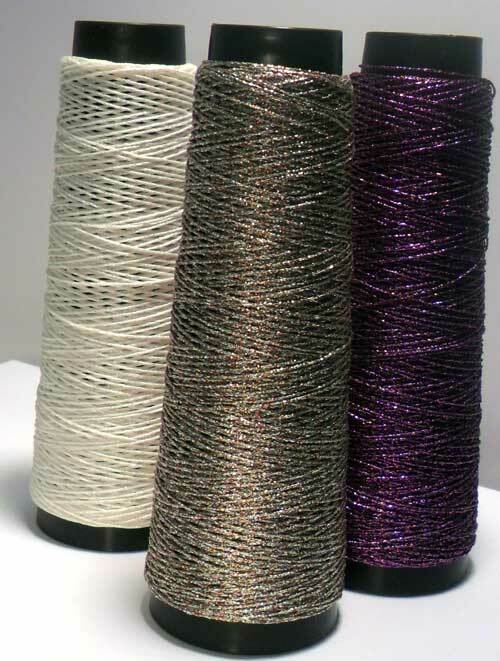 Use this metallic thread alone for beading designs, tatting, and lace making techniques, or use as a blending thread for accents in larger crochet and knitting projects. Click on arrow to close tip. Use any of the basic colors for warp (those without a letter after the color number). Use any color for weft. Sett is 24 epi (experiment with looser sett if desired to vary drapabiity). Make test swatches if using stretchy yarns with the more inelastic metallic, then use a warm-water wash for the wet-finishing. Click on arrow to close tip.